This shape is a new shape. It´s between the low and the medium on if I remember right. The deck is 33mm wide and @ Fonky you could get even more than 33mm decks. This deck is 33,4mm wide!!!!! The boards perform great. My last setup was a Fonky Fingers and I had a lot of fun with it! Check out my last board over here: Click! Like I told you allready some months ago and I´m not getting tired telling you: there are a lot things going on at Fonky Fingers. The new lineup of wood/concrete/plastic ramps is super sick and the new boards well done fingerboards. Get something cool at the Fonky Fingers webshop now: Click! Show some love at the Fonky Fingers facebook page: Click! 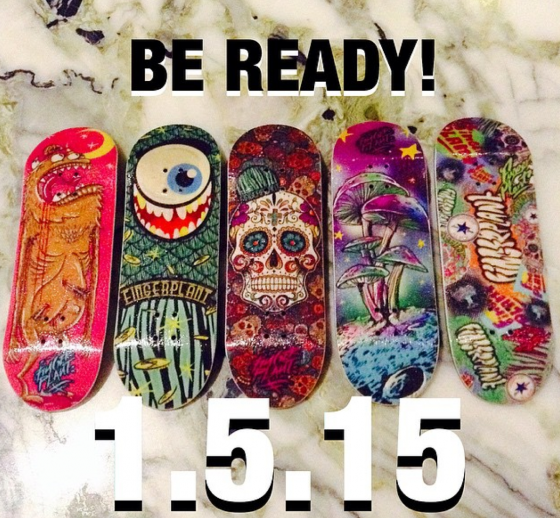 Great announcement on the Fingerplant instagram site! Ramon Angelow & Oskar Schoen! This deck got a well defined shape and the graphic is bright and shiny. The shape is up to date and the holes a perfectly drilled. The overall craftmanship is perfect. You won´t regret buying a Wolfb! The decks are available at TNP now and directly at the Wolfb website: Click! I´m really sorry but I don´t understand any single word on the website. There is no englsih version available. But the company offers even more than decks. Just browse threw the website and check out what they got.